Email overload is a problem that’s as common as it is difficult to solve. Fortunately, everyone know it’s a problem, and there are plenty of startups (and webmail providers themselves) looking to fix it. One recent entry to the space is AwayFind. The service, which opened to the public earlier this year, allows you to set up filters identifying the most important messages that hit your inbox— emails from coworkers, family members, or perhaps those that have “IMPORTANT!” in the subject line. When one of these urgent messages comes in, AwayFind can alert you with a text message, phone call (that actually reads the message aloud) or IM. All of the site’s alert settings are customizable: you can choose to receive an alert every time your boss emails you, or only when you get a new message in an especially important email thread. You can also choose time limits for each alert, and there’s also an auto-responder feature that you can use to direct people to a personal contact page (Awayfind lets you make one, or you can link to your own website). The site’s signup flow is a little too involved (you’ll have to verify each SMS/voice account you want to send messages to, decide if you want to use the signature feature, and so on). But once you’re set up it’s pretty straightforward, with tabs listing your filters, signatures, and an inbox of messages that your filters have flagged as especially important. The service works best if you’re using Gmail in tandem with AwayFind’s browser extensions, which are available in Firefox and Chrome, and lets you set up filters directly from your inbox (AwayFind also has an email gadget on the Google Apps Marketplace, which is the company’s fastest growing segment of user acquisition). If you aren’t on Gmail, AwayFind also supports other email accounts through IMAP and Exchange; you just won’t be able to use the browser extension and will have to manage your filters from the AwayFind site. As with similar services, AwayFind can potentially access your email messages, which may turn off security-conscious users. That said, it uses oAuth to access your Gmail account which is safer than if you were actually handing over your password (which you’ll have to do if you want to use an IMAP account). 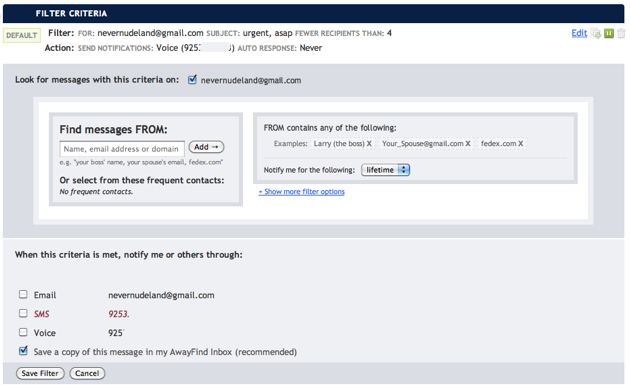 And AwayFind says it only stores content from your email when you tell it to archive messages. The service is free for now, with plans to eventually change to a freemium setup — the company is still deciding which features will be free and which will only be available to premium users. Also see Etacts, a Y Combinator-funded company that helps you keep in touch with the contacts that are most important to you (see our past coverage here).